In August 2016, Charlie reached the semi finals in both Singles and Mixed Doubles, and the final in the boys’ Doubles, at the Refrath Cup in Cologne, defeating players from France, Germany, Belgium and The Netherlands on the way. A week later, Charlie won a silver and two bronze medals at the U13 National Badminton Championships, and a couple of weeks after that, he played for the England U13 team at the Swedish Youth International competition, where England came second in the team competition, losing only in the final golden set as the final was tied. In the individual competition, Charlie lost in the second round to the eventual winner. 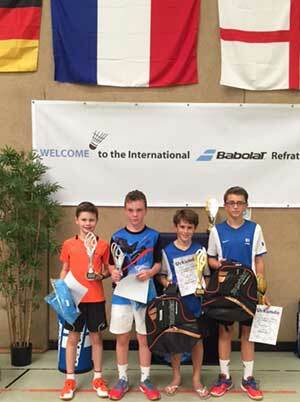 In November that year, Charlie’s year got even better when, at the Danish Cup in October, playing again in the England U13 team, he made it to the Singles semi finals, where he lost in a hard-fought battle to the top French boy. He also made it through to the quarterfinals in both the Mixed and Level Doubles. The English team played well, beating a team from Finland and some strong Danish teams, to finish 5th (out of 10 teams) overall. The players were exhausted after intense competition, but returned home proud of the best results to date by an English squad at U13 level at the Danish Cup. Unfortunately, 2017 was a tough year for Charlie, because he struggled with illness, but 2018 has been much better – with Charlie winning both the U15 Bulgarian Badminton Championships and the Dorset U16 Championships.